Let’s face it, a dental emergency is never fun and often very painful. So, it’s great to know you have an emergency dentist in your local area ready to help. Perfect Smile Dental is a local emergency dentist and rated as one of the best dentists in the Las Vegas area. We are available during all office hours to help with your dental emergency, our staff is able to get you help immediately with expedited appointments. The biggest benefit to living near a trusted emergency dentist is that you know where to get help when you need it most. You can’t predict when you may end up with a broken tooth, extreme tooth pain, or inflamed gum. Regular dental cleanings and checkups can help prevent these problems, but there are occasions that can cause emergency appointments. Having an abscessed tooth is very painful and can also be a serious dental emergency. An abscessed tooth is often caused by a bacterial infection. The most common symptom is noted as severe pain in the tooth where the abscess is located as well as towards your ears and neck. If left untreated, the abscessed tooth can only get worse and even become life-threatening. If you think you may have any kind of abscess, give us a call at Perfect Smile Dental. Our staff will assign you an emergency appointment so that our emergency dentist team can see you right away. Toothaches are never fun and are always convenient. If you ever suffer from dental pain that is severely debilitating, we suggest an emergency visit right away. Unidentified dental pain can be caused a number of very serious dental problems and we want to make sure your wellbeing is protected. The good news is that at Perfect Smile Dental our goal is to offer full pain-relief emergency dental care. If you have severe tooth pain, call us to set up an appointment today. Our office staff will help you in at the earliest possible time. Not all chipped or broken teeth mean a dental emergency. But some do. If you have chipped a tooth and it doesn’t hurt, you can usually wait a couple days to see the dentist. If you have cracked or fractured any of your teeth and lost parts of your tooth, that should be considered a serious issue and should be treated as a dental emergency. Emergency Dentist or an Emergency Room? So, how do you know whether you should visit the hospital emergency room or your dental emergency clinic? Is your dental emergency required to repair or save a tooth? To stop on-going bleeding? To help relieve you of severe pain? If so, then you will want to come to Perfect Smile Dental for your dental emergency. Is your dental emergency the result of a fall, an accident or any type of face trauma? In this case, you would want to see your hospital emergency room. You will want to make sure that you have no further injuries such as a concussion or broken facial bones. At Perfect Smile Dental we are always ready help patients in any dental emergency. 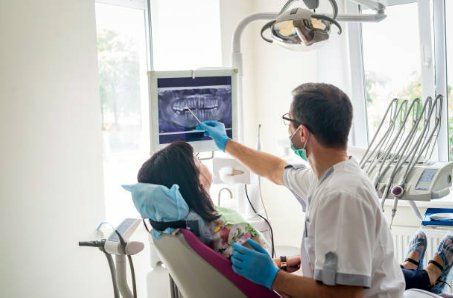 We also offer general dentistry that utilizes the latest technology to provide you with the best dental care in the Las Vegas area. Give us a call today to set up an appointment for all your dental needs, emergency or otherwise. With affordable pricing and a partnered service for all major dental insurances, we make it easy for you to get the best in dental care you deserve. See for yourself why Perfect Smile Dental is rated one of the best dentists in Las Vegas now!